A fine example of the influence of the Art Nouveau (Arts and Crafts) style period on everyday objects like ice skates. 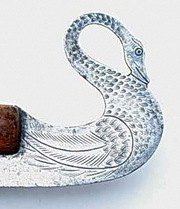 The swans have been chiselled in the steel of the blades by hand (detail 1). They make an elegant pair of ice skates.